Catania is Sicily’s second largest city, with a population of around 300,000. 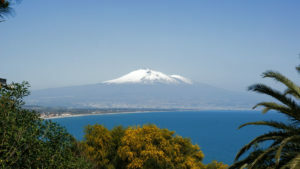 It lies on the Ionian Sea, under the shadow of Mount Etna, or “A Muntagna” as the locals refer to it. Mount Etna is ever-present and has to a large extent shaped both the history and the actual existence of Catania. On several occasions volcanic eruptions destroyed the city, the most devastating of which happened in the 17th Century. In 1669 Catania was covered in lava and then, just 24 years later in 1693 an earthquake shook the town down to its foundations. The reaction to this latter catastrophe was amazing: the entire old part of town was rebuilt in Baroque style, with large, wide open squares and avenues. The most remarkable aspect, however, was the building material used: lava! Catania is essentially a “grey” city and unique in the world for this. Visiting Catania is quite easy, as the old town centre is relatively small. An ideal starting point would be the main square, Piazza Duomo. This delightful square and all its surroudning buildings was designed by one man, Giovanni Battista Vaccarini from Palermo (don’t mention this to Catanians, however, as their rivalry with Sicily’s capital is intense!). The Cathedral, dedicated to St. Agata, the city’s patron saint, stands on the site of an 11th Century church that was almost entirely destroyed in the 1693 eruption. Its replacement is a very impressive, imposing Baroque structure that incorporates some Roman columns taken from the amphitheatre. These are not the only Roman elements, however, as underneath are some Roman baths. Inside, the Baroque theme continues with several ornate chapels and a fresco recording the 1693 earthquake. Bellini, Catania’s most famous son, is buried here, as are (in ash form) three Aragonese kings: Frederick II, Louis and Frederick III. The other sides of the square are equally impressive and include the Diocesan Museum and the Municipio, (town hall) built in 1741. In the centre stands the city’s symbol, a lava elephant fountain carrying an obelisk. It bears an enigmatic inscription, MSSHDEPL, which according to some is an acronym for “The mind of St. Agata is sane and spontaneous, honouring God and liberating the city”. Such is the devotion to St. Agata in Catania that there are another two churches named after her, one just across the road from the Cathedral, the other just a short walk away off Via Etnea. Heading south from the piazza you will go under the 17th Century arch of Porta Uzeda towards the port. A quick right here will take you into Catania’s colourful, bustling and odourous fish market. Get here before lunch and you will enter a different world, an atmosphere that has remained virtually unchanged for hundreds of years. If you don’t get lost in the hullabaloo of the market and head south west, you will come to Piazza Federico di Svevia and the old fortress of Castello Ursino. This imposing structure was built by Frederick II of Hohenstaufen in the 13th century on a rocky cliff overlooking the sea. However, the massive lava spill of the 1669 eruption pushed the sea back, creating in one fail swoop a new coastline and stripping Castello Ursino of its strategic position. Moving back northwards you will come across a rather different aspect of the city: its ancient origins. Catania was founded in the 8th Century BC by Greeks from Chalcis. It subsequently became a Roman city and amazingly, considering the dramatic series of volcanic eruptions and earthquakes that have so afflicted the area, three theatres have survived from this period. The Teatro Romano, in Via Vittorio Emanuele, was built on the site of a Greek theatre in the 2nd Century AD. Its use of lava stone demonstrates how long the excretions of Etna have been put to good use. Next door is the Odeon, a smaller theatre used for more intimate occasions, such as musical performances. The Amphitheatre, found in Piazza Stesicoro at the crossroads of Via Etnea and Corso Sicilia is and not usually open to the public, though can be viewed from outside. It is well worth enquiring about a special tour, however, as it was the largest amphitheatre in Sicily, said to accommodate around 15,000 spectators. A fascinating warren of passages runs underneath it, bringing to mind its more famous cousin the Colosseum. The area around the first amphitheatre is given over to a series of churches and the Museo Belliniano, dedicated to Catania’s most famous son, the composer Vincenzo Bellini. A short walk north east will take you to another building dedicated to his memory, the opera house Teatro Massimo Bellini. The opera season runs from around October to June and is well worth a visit if opera is your thing. After a performance you could go for a bite to eat in one of the many restaurants in the area. The signature dish of Catania, Pasta alla Norma, is also dedicated to Bellini and consists of fried chunks of aubergine, a rich tomato sauce and salty ricotta cheese….. Buon appetito!